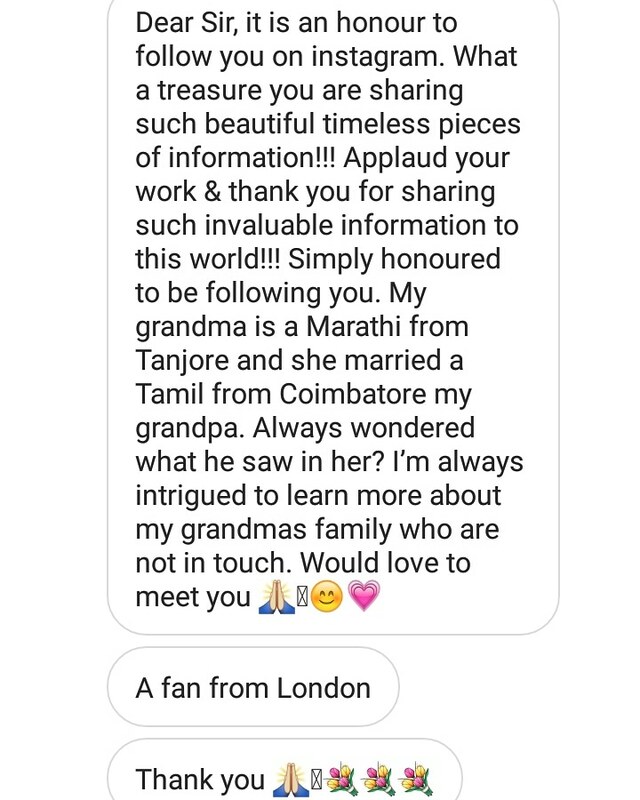 Compliment from one of my Instagram follower. Thanks for these kind words and appreciation. THANJAVUR CULTURE in those days was a mixture of Tamil, Telugu and Marathi. The culture and tradition at Thanjavur alone was different and unique in Tamilnadu. Thanjavur was a house to the people belonging from different communities i.e Tamil, Telugu, Marathi etc. As from history we all know that Thanjavur was a princely state ruled by Cholas, Pandiyas (short period), Nayakas and Marathas. The people and family who came along with the kings had been settled here and were regular in practicing their traditional customs, rituals etc. In modern times i.e in 18th,19th century the people of all three communities were residing together which made a turning point in a change in mixture of culture and tradition. 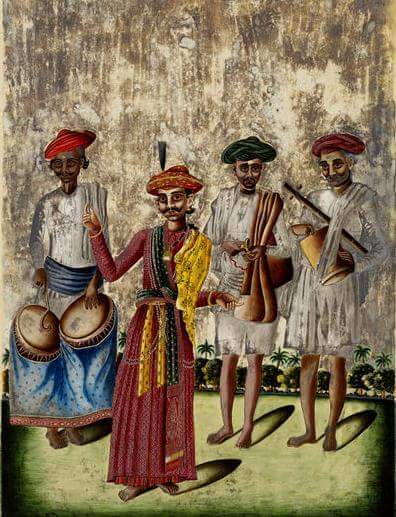 The festivals, cultural activities were celebrated in a unique manner where the practice/ritual would be involved in a mixture form of the traditional/cultural customs of all these three communities (I.e Tamil, Telugu and Marathi). It is also evident that Maratha Kings of Thanjavur were the patron of Tamil, Telugu culture and fine arts- which was flourished and encouraged during their rule. In 20th century there was no any racism or casteism problem at certain societies or areas in Thanjavur or in Tamilnadu because of Education and highly knowlegable persons.There were no hesitation for intercaste marriages. So marriages were done among Tamil and Maratha family or among Maratha and Telugu family or among Telugu and Tamil family. That really gave a strong bond and relationship among those communities. Today not even 10 percent Maratha families are seen in Thanjavur as many had been migrated to different states (mostly to Maharashtra) and abroad. There is a Tamil film named ‘Dubashi‘, which is on YouTube. This movie is based on a life of Thanjavur Maratha family. Traditional ritual at Thanjavur Maratha bramin family. Video Courtesy: Dasbodh.com. 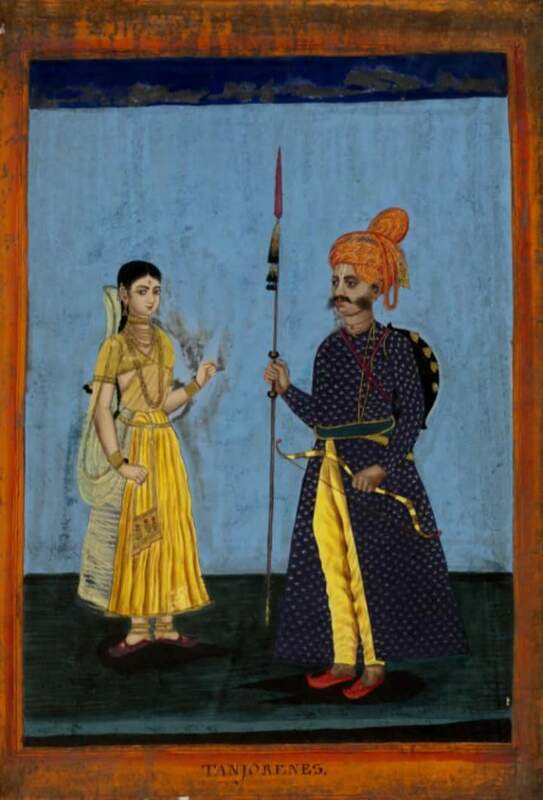 Tanjore Maratha couple c.1770 Gouache. Book on Thanjavur Maratha recipes documented/written by the order of Baroda Maharaja H.H Sayaji Rao Gaekwad. 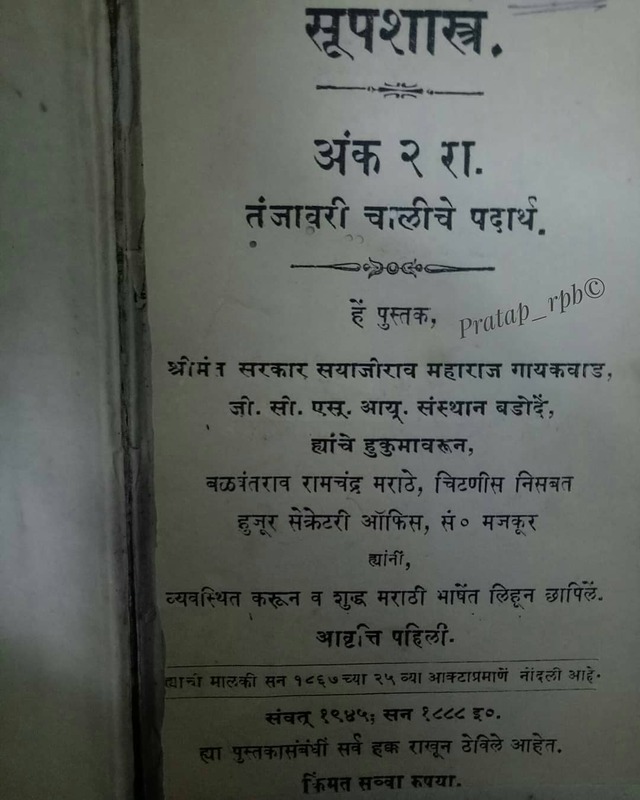 This book is the first edition published in 19th century (1888 A.D) by Jagade thechu Printing press., Pune, Maharashtra. 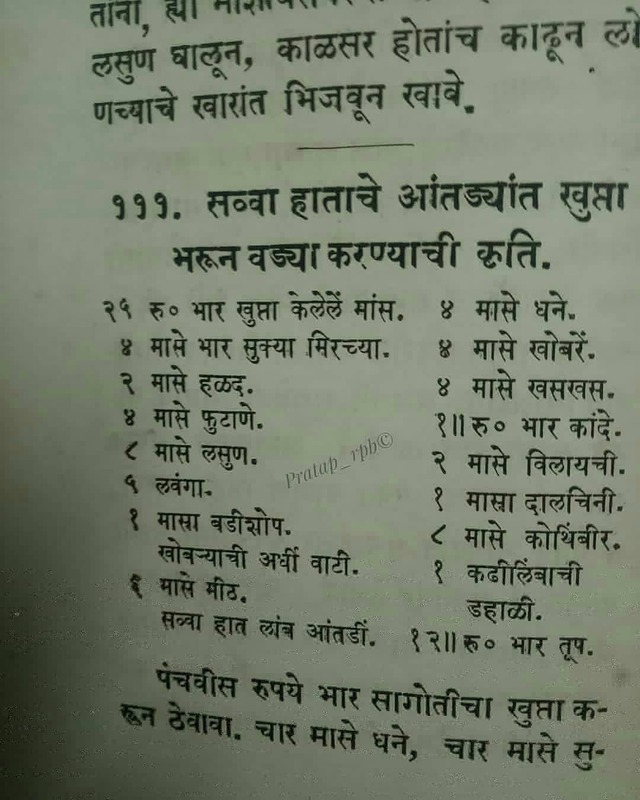 There are more than hundred unique Thanjavur Maratha recipes (Veg and Non Veg) in this book. Baroda maharaja Sayaji Rao Gaekwad visited Thanjavur Palace and was fascinated towards Thanjavur Maratha culture, tradition and culinary skills. Stated in my grandfather’s book that he had purchased many books on various subjects from Thanjavur Maharaja Serfoji’s Sarasvati Mahal library (TMSSML) and had republished it in his native. Feliciating Smt. R. muthukannamal., Sadhir Dancer from Viralimalai,Trichy. She was honored today (17/3/2018) with the DakshinaChitra annual award for her excellence and lifetime contribution to Sadhir dance. She is also called as the mother of Bharatanatyam. She is one of the few surviving artistes who can impart sadhir dance to future generations. The characteristic style of Sadhir is that the performer dance and sing at the same time. As a dance form, Sadhir underwent many challenges and it eventually gave birth to Bharatanatyam. Like Sadhir, the artists who practiced the dance form also faced challenges. But some artists didn’t give up. Without any sponsorship and support, they tried to make Sadhir popular. R Muthukannamal, the last Devadasi -Sadhir dancer from Viralimalai, is one among them. Sadhir is a precolonial temple dance in TamilNadu which later transformed into Bharatanatyam. 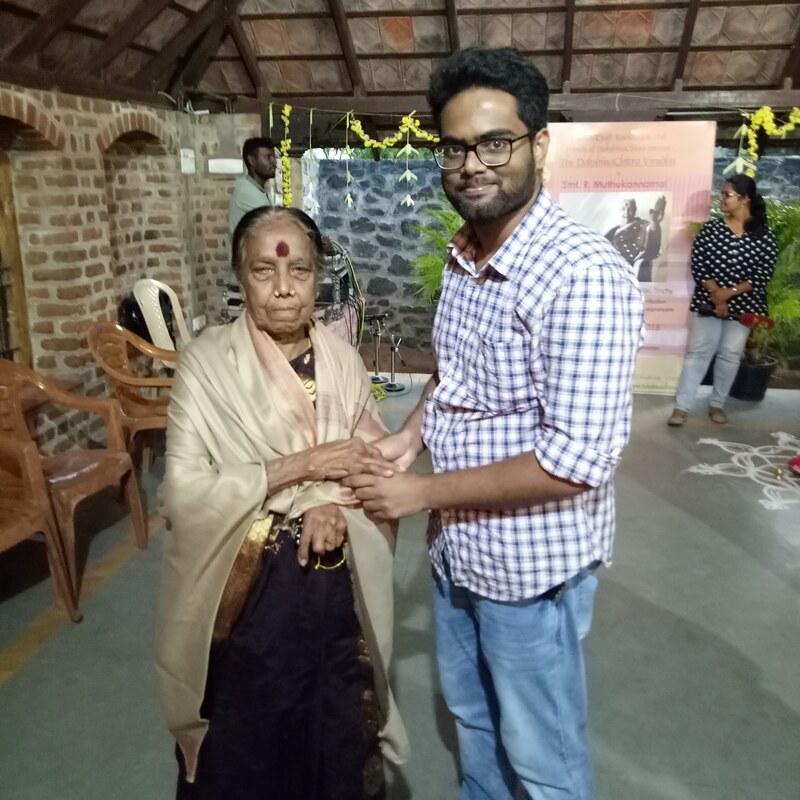 Born in Viralimalai, 28 km from Trichy, 89 years old Muthukannamal and her family were closely associated with temple dance practices in the Muruga temple as well as in Pudukottai Shiva temple there. Muthukannamal had been a Devaradiyar trained since the age of eight, under her famous Nattuvannar father and grandmother. King Rajagopala Thoondaiman had gifted agricultural lands to their family for their services. She is the seventh generation of the devadasi tradition and the only surviving dancer of the 32 contemporaries at the Muruga temple in Viralimalai.Muthukannammal still performs Sadhir. There was no support to the dance form from anyone.But she sticked to Sadhir and popularised the dance form.To create awareness about Sadhir and also to popularise the contributions of Muthukannamal, former Madras Art College principal and veteran sculptor G Chandrasekaran (fondly called Chandru) made a sculpture of Muthukannamal at his art school for the disabled in Tiruvelveli in 2017. The sculpture in clay symoblised the challenges of an artist in keeping alive a dance form under odd circumstances. Sadir Dance was performed in temples and in royal courts and the name ‘Sadir’ to this classical dance style was given during the Maratha rule in Thanjavur by the Marathas.